1. Put the hazelnuts in the bowl of a food processor and whizz until finely crushed; tip out into a large mixing bowl and set aside. Whizz the oats until fine and tip into the bowl with the hazelnuts. Next put the dates in the food processor with about 3 tbsp water and whizz, scraping down the sides if necessary, until they become a paste. 2. Mix the almonds, maca powder (if using), cacao powder and a pinch of salt in the bowl with the ground oats and nuts. Add the date paste and mix well to a stiff dough. 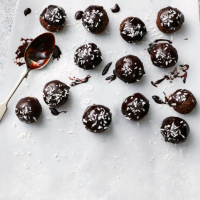 Roll into 20 truffle-sized balls (about 20-25g each) and press gently onto a parchment-lined tray to flatten the bases slightly. 3. For the glaze, whisk the coconut oil, maple syrup, cacao, cinnamon and a pinch of salt until smooth. Dip the top of the truffles into the glaze; scatter each with a little desiccated coconut. Chill for at least 2 hours before serving. This recipe was first published in Mon Jan 01 12:15:16 GMT 2018.